WD-SDC type DN50 to DN400 RF Card industry prepaid water meter is realizing the prepaid function through the application of Radio Frequency technology and the smart management system, it provides a perfect solution for the Water Authority. The smart module features in accuracy and stabilities. The prepaid water meter is in compliance with ISO4064, EN14154 etc. International standards. Use to modify the ROOT key of DES encryption. Use to initialize the user information in the meter. Such as Presetting Water Value, Warning value, Overdraft Value, Stock Limitation etc. Information and Warning Events will be formatted. 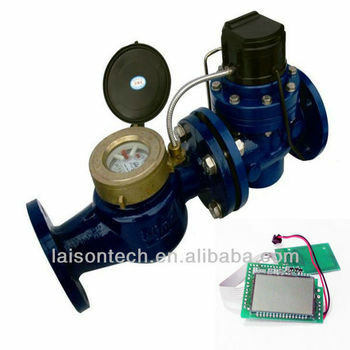 Use to purchase water, and set water meter parameters such as Warning Value, Stock Limitation and Overdraft Value etc. Water Authority operators can check the error information and meter status information through the user card. Operators can check the meter status and parameters through the check card, such as meter No., user No., Total Purchase, Total Use, Low Voltage times, Magnetic Influence Times, Battery Voltage etc. 1) Function Code: Indicate the displaying content. 2) Warning Sign: If the meter is displaying error information or warning information, the warning sign is displayed. 3) Valve Status: If the valve is closed, then the sign of Tap glitter, and water dripping disappeared. If the valve is opening, the Tap is displayed and water dripping glitter. 4) Battery Status: If the battery is almost used up, the sign of battery will be displayed. 5) If water balance is less then Warning value the sign of Purchase is glitter.